There has been rumors since early August that Linda Chung (鍾嘉欣) has given birth in Canada, but these reports have been denied by her agency, TVB. Earlier this week, new reports have surfaced claiming that Linda’s husband, chiropractor Jeremy Leung, left work on parental leave. TVB, as well as Linda’s close friends in the industry, all reacted with confusion in regards to the reports about Linda having already given birth, and they all unanimously said they will be waiting for Linda’s official announcement. On the morning of August 27, Hong Kong time, Linda made the announcement official on social media. She shared a picture of her baby daughter, already in a full head of hair, tucked inside a pink and white blanket. Congratulations to Linda and Jeremy, and welcome baby Kelly! Like I said, she was most likely waiting for 滿月, which is one month to announce it. Really happy for her. Hope she’s living the quiet life she’s always wanted. I remember in an interview she said she had something like depression when she first entered the industry. Congratulations!!! Where did you get the baby 1month old from? She only said its a Leo baby. Which could be anything btw 23 jul to 22 aug.
Thats a very smart thing to do since she didnt lie about bday but didnt exactly tell people the date so its still a mystery on whether her wedding was shot gun or not. Not talking about banquet but the day she register for marriage. @1nit in Chinese tradition, parents usually introduce their baby after their 1 months birthday. I think that’s what @abcd mean in regards to her waiting for 1 months till baby was shown to public. As lots of reader here is saying the baby look bigger than a newborn. Congratulations to Linda and Jeremy. Happy news for sure. this baby girl definitely looks more like one who has passed the new born stage…new born babies don’t resemble either parent. anyway, all the best in her new life as a mother. she will probably fade away. That child is definitely not a brand new baby. I like Linda but, she handled this pregnancy matter suspiciously. She is a mature, grown woman. It is not like she is some teenager who got pregnant. Even teens don’t pull such stunts when pregnant. Then again, when you want the world to believe that you are all virginal and virtuous, and a pregnancy happens, I guess there is a reason for such fishy, crazy stunts. Being a Celeb in Asia is so difficult. Get criticize for everything. I am not surprise at all at her actions. I dont like it but its normal behavior. 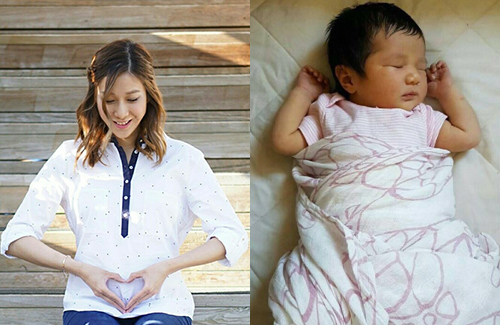 Look at what Athena Chu got when she was honest about her pregnancy. Actually Athena got it worst with her honesty. So if i am Linda i would not be honest and just let the public speculate what ever they want. People’s view change as they get older and circumstances change. So when they were younger they may believe in no x before marriage but then when they meet the right person, they think differently but HK seem to not allow that. The comment will b used against them and they are expected to uphold everything they said in the past. No actions could please everyone. So she and her management company chose the path that is least damaging to her career. @1nit very good comment with great points. Yes being a celeb means being scrutinized by the public as every move the celeb makes is being watched and critiqued. The problem with Athena Chu is she was preaching abstinence to the masses when she herself became pregnant. Wouldnt people be bashing Linda too like Athena if she wear to admit shot gun wedding. Did Athena actually preach b4 she met her hubby? Or did she continue to say the same thing during her relationship like Grace Wong who continuously remind people that she is still a virgin? I know a person who found it difficult to admit shotgun wedding due her conservative family background. Her child have 2 birthday. 1 is the real and the other 1 is the date that she tells the world he was born to cover up. People didnt get to see her child until 2-3 yrs old. Not a word was slipped by her or her family to the closest friends and relatives. So if a normal person feel the need to lie and cover up, I would expect a celebrity must do even more because it is their career and future. @1nit yes, Athena was preaching the abstinence mantra to the masses when she herself became pregnant. Sometimes, the handlers are the ones promoting this virginal image because it gives more popularity to the celebrities. More fame usually means more money for everyone, including the handlers. One thing about this he Hollywood celebrities, they do not hide their pregnancies, whether they go to church or not. Asians want to live in the purist era too much, that is what the problem is. Such purist expectations put immense pressure on everyone. That pressure is double for celebrities. You didnt really answer my question. I know Athena preached. But when did she say it? Before she met hubby, during dating with hubby or still did it when she became pregnant? Im not trying to pick a fight. I really dont know much about Athena’s preaching until she got pregnant and got all the backlash. This is strange because I thought she’s afraid telling the world about her pregnancy and have to hide it too and now she’s showing her daughter to the world? Must be a joke about her daughter she doesn’t looked new born to me at least a few months older. I bet she had already give birth to her daughter when she made that video of herself with the stuff animal hiding? So basically I think that video been made after she give birth that’s why she used that stuff animal to hide her tummy so you can’t tell rather she had given birth or not yet and you can tell she looked little bit different too. Anyway congrats to her. @asian2015 since she was afraid to tell the world about her pregnancy, why show the picture of a 3 month old now? That picture doesnt look like a 3months baby. 3 months is normally more full. It is definitely not new born either. To me the baby looks like around 1-2 month old. Not saying she didnt give birth in June. Pictures could b taken any time. So she could take a new born picture and upload it 3months later n say baby just born. What i question is she said baby is a Leo baby. Which is born earliest 23 July. Would she b that stupid to lie about birthday. People can get a hand on the birth registration. Like how Andy got busted when they found his marriage registration. So to me it make most sense that she gave birth late Jul or Early Aug. Around the time Eliza visited her. That means the pregnancy started early Oct. So she would find out in Nov. She said she registered for marriage in Fall 2015. Thats Sep-Nov 15? So if she register in Nov which is immediately after she found out about the pregnancy. She still didnt lie. She is only guilty of purposely misleding/confusing the fans. This whole thing is dubious. That baby is definitely not a newborn. But I guess there’s an image to keep up. Linda has some great friends though. Doesn’t reveal anything before she does so herself. in the clip, it is mentioned she gave birth in june. @janet72 I read an article on the date when Eliza went to visit her on 8/5 that she gave birth in June. I knew it because baby bump usually don’t show until 4-5 months preg. Her wedding gown clearly gave it away. I still think she’s weird about this whole pregnancy thing. People will find out eventually not only that there are many moms out there that have experience. It’s better to say nothing at all if she wanted to stay low profile rather then giving people suspicion news. @azndoraemon when she performed with Ruco in Feb, she was already pregnant…that white dress gave her away. it’s better not to lie about pregnancy because people will find out. she was stupid to try and confuse people in the first place.